The 1949 release of “Rope of Sand” was a return to form of sort for producer Hal B. Wallis, who had struck gold seven years earlier with a little film called “Casablanca”. To that end he brought back three of the supporting actors from that film for “Rope of Sand” and while it would be easy to dismiss this as a kind of poor-man’s “Casablanca”, it does hold up on its own as a solid action-noir exercise. Burt Lancaster plays Mike Davis, a guide and explorer who leads rich game hunters through the savannas of South Africa. When one of his clients decides to wander into a prohibited zone of diamond mines in a desert to look for some free loot, Mike chases after him only to discover the wayward hunter near death, but surrounded by glittering stones. Mike buries the diamonds, but is captured by the brutal and sadistic Commandant Paul Vogel (Paul Henreid), head of security for the mine. Vogel beats and tortures Mike to get the location of the diamond horde from him, but to no avail. Flash forward two years, and Mike has returned, both the retrieve the treasure and get revenge on the cruel Vogel. 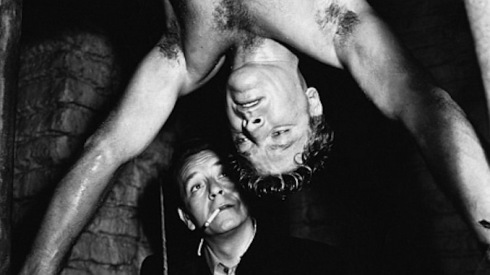 He runs across the manager of the mine Arthur Martingale (a fabulous Claude Rains), who sees in Mike an opportunity to both get his property back and perhaps sideline the ladder-climbing ambitions of Vogel. For leverage he hires slinky French femme Suzanne Renaud (Corinne Calvet) to entrap both men and play them further against each other. But will her feelings for Mike betray her ultimate mission to get the treasure? 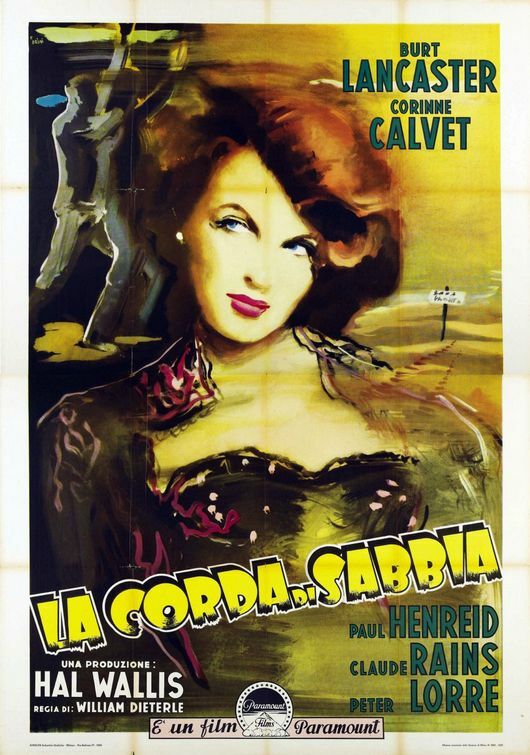 “Rope of Sand” (the awkward title refers to the ring of desert sands around the mine) is a fairly routine inter-continental Caucasian people in Africa adventure story, shot with heavy doses of noir. Lancaster and Henreid are game in pretty standard good guy/bad guy roles, but the real star here is Claude Rains who simply shines as Martingale, the wealthy diamond merchant bemusedly playing some intricate chess game with the characters fates. Cool under pressure, and seemingly impervious to both violence and womanly wiles, Rains perfectly personifies the mysterious and ambiguous noir man of the era. 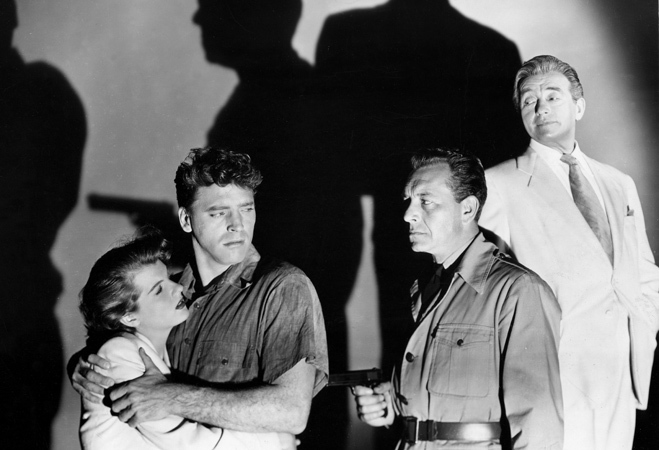 The chase and action scenes are well filmed, and the movie in general is well paced, making a Rope of Sand a nice addition to the post war noir cannon, and an interesting footnote to Casablanca. 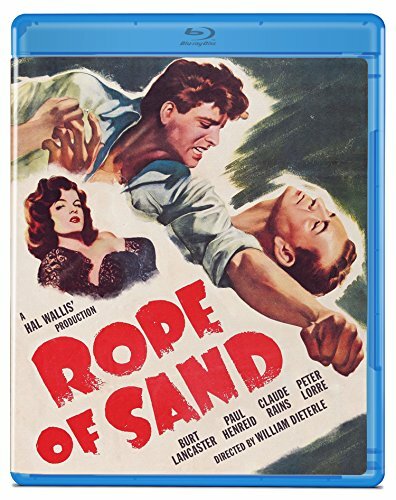 “Rope of Sand” was originally part of a Noir Collection, along with “Union Station”, “Dark City” and “Appointment with Danger”, and is now released separately on Blu-ray by Olive Films. It is presented in the 1.37:1 aspect ratio in 1080p with no extras included. While the audio is an English language Dolby Digital Mono track with some noise issues here and there, but the image is near perfect with its ink blacks and clear backgrounds, making it feel like a restoration. However, here are no extras included.